Professionals within the urban and regional planning domain have long utilized GIS&T to better understand cities through mapping urban data, representing new proposals, and conducting modeling and analysis to help address urban problems. These activities include spatial data collection and management, cartography, and a variety of applied spatial analysis techniques. Urban and regional planning has developed the sub-fields of planning support systems and Geodesign, both of which describe a combination of technologies and methods to incorporate GIS&T into collaborative planning contexts. In the coming years, shifting patterns of global urbanization, smart cities, and urban big data present emerging opportunities and challenges for urban planning professionals. Goodspeed, R. and Grengs, J. (2017). GIS&T in Urban and Regional Planning. The Geographic Information Science & Technology Body of Knowledge (4th Quarter 2017 Edition), John P. Wilson (ed). DOI:10.22224/gistbok/2017.4.2. This entry was first published on October 11, 2017. No earlier editions exist. Urban and regional planning is a professional field concerned in the broadest sense with the shaping of urban form and addressing urban problems. To do this, planners are engaged in a wide range of activities, including developing plans at various scales, conducting studies of various problems, seeking the knowledge and participation of stakeholders, and proposing programs and policies. Since urban processes have a strongly spatial character, GIS&T have long played an important role in the urban planning profession. In fact, Daniel Burnham’s 1909 Plan of Chicago, widely recognized as the first comprehensive urban plan, features extensive maps illustrating proposals for new parks and public facilities, and even includes a choropleth map of population density used to illustrate the need for new parks and street improvements (Commercial Club of, Burnham, Bennett, & Moore, 1909, p. 82). Another important precursor to modern GIS&T is the work of landscape planner Ian McHarg, who advocated overlay mapping techniques to identify land suitable for urban development which are reflected in modern suitability analysis techniques (McHarg,  1992). Despite these early precedents, use of GIS&T within urban and regional planning has vacillated due to shifting views of information technology within the profession (Klosterman, 1997). In particular, early efforts to apply IT in planning were intertwined with technocratic forms of professional practice which ignored local concerns and often harmed urban communities through urban renewal initiatives. In the years since, the professional field—and the ways it uses IT—have evolved significantly. As a profession with a deep engagement with geographic concepts which undergird GIS&T, planners were among the earliest adopters of desktop GIS software in the 1980s and 1990s (Innes & Simpson, 1993), and subsequent GIS&T developments like geocoding, GPS, and web-based mapping (Drummond & French, 2008). Today, GIS&T is well-established in the toolkit of professional planners, where it is increasingly integrated into diverse inquiry of urban problems. This entry emphasizes prominent ways GIS&T are used in urban and regional planning, showing a range of ways that professionals draw broadly on GIS&T knowledge in their practice. The topic is organized into the following categories: spatial data collection and management, cartography, applied spatial analysis, integrating GIS&T into practice with planning support systems and Geodesign, and a description of future prospects related to shifting global urbanization, smart cities, and urban big data. The foundation of creating an urban plan is an analysis of the existing conditions. Therefore, planners make extensive use of GIS&T to collect, organize, and map spatial data. As a result, planners have been key stakeholders involved in the creation of spatial data infrastructures (SDI), or the “technology, policies, standards, and human resources necessary to acquire, process, store, distribute, and improve utilization of geospatial data” (Executive Order 12906, 1994). Planners are often involved in sharing data, requiring maintenance of metadata, keeping data secure, and ensuring privacy when necessary (Nedovic-Budic, Pinto, & Warnecke, 2004). Increasingly, in addition to these traditional data-creation activities, professionals are engaged in the use of GIS&T to collect spatial information from project participants themselves. For example, in a study of physical activity, researchers collected information from residents about their use of park space, something which has been historically difficult to collect (Brown, Schebella, & Weber, 2014). These projects may fall under the categories of public participation GIS (PPGIS), bottom-up GIS, participatory mapping, or crowdsourcing, but they share the goal of working together with community members to create new spatial information to better understand cities (Talen, 2000; Thompson, 2012). Planners utilize GIS&T extensively to map existing data for use by planning stakeholders, such as making thematic maps from data from the U.S. Census or other federal agencies, and mapping local information about parcels and infrastructure (Williamson, 2008). Furthermore, planners utilize GIS&T as a medium to represent various proposals, such as creating maps illustrating proposed future land-use patterns, community facilities, or transportation infrastructure. Good planning draws on cartography best practices to convey information to a diverse array of stakeholders. Kent and Klosterman (2000) describe several pitfalls planners should avoid when creating GIS maps, including failing to define the map purpose, displaying data at inappropriately large scale, neglecting projections and coordinate systems, failing to document sources, omitting map elements, presenting too much information, and misrepresenting data. Emerging technologies draw on geospatial information to create immersive, multi-media experiences to communicate with stakeholders (Schlickman & Domlesky, 2016). Accessibility analysis utilizes network analysis to determine what destinations (e.g., businesses, schools, and stores) can be reached from any particular point within a time threshold, utilizing various transportation modes (Greene & Pick, 2012). Buildout analysis describes the use of GIS&T to investigate existing land-use regulations to estimate the development capacity of a study area given existing zoning and other land-use regulations (Godschalk, 2006). Built-environment metrics have been used in planning and related fields to conduct research investigating the relationship between urban form and a variety of outcomes such as travel behavior, obesity, and physical activity. Researchers utilize GIS&T to translate existing GIS data into metrics like intersection density, land-use mix, and indicators for urban design attributes like enclosure, human scale, and complexity (Ewing & Clemente, 2013). Variables in these categories have been found to be negatively related with total auto travel, and positively related to walking and transit use. Although this work was pioneered by researchers, their findings are increasingly being utilized by professionals to plan for more sustainable cities. These research findings have been incorporated into planning support systems such as Envision Tomorrow (see below). Equity analysis assesses how social conditions and opportunity are related to geographic space, including issues such as income and race segregation, poverty concentration, exposure to environmental harms, exclusionary land-use and housing policies, and municipal service delivery (Grengs, 2015; Talen, 1998; Wolch, Wilson, & Fehrenbach, 2005). Large-scale mapping and analysis are often conducted by planners, since they often focus on geographies such as a neighborhood or street block, resulting in the need for specialized analysis techniques. These include the use of proportional split analysis to estimate a population within a unique geography, such as within a certain radius of a transit line or community facility (Schlossberg, 2003); dasymetric mapping which can identify challenges, such as poverty concentration, at neighborhood scales (Grengs, 2007); and address matching or geocoding, which allows for the analysis of precise locations of businesses, schools, or homes (Drummond, 1995). Indexes combine multiple variables to create a map representing an overall assessment of a study area. For example, a study of Vancouver, Canada combines five factors to create an index of the ease of using bicycles (Winters, Brauer, Setton, & Teschke, 2013). A study of the Baltimore, Maryland region combines demographic and social status factors of residents to create an index of the need for park space (Boone, Buckley, Grove, & Sister, 2009). This index is then used as part of an analysis which concluded that predominantly black areas were underserved by parks compared to predominantly white areas in the region. Natural hazards assessment includes GIS&T analysis to complete hazard identification, vulnerability assessment, and risk analysis conducted as part of a process to create plans to minimize the risks of hazards like hurricanes, earthquakes, and floods (Olshansky & Wu, 2001). U.S. Federal Emergency Management Agency has created the HAZUS GIS software to facilitate the estimation of potential losses from disasters and identify high-risk locations (fema.gov/hazus). Scenario planning can utilize a variety of techniques, but often utilizes specialized tools such as CommunityViz, UrbanFootprint, and Envision Tomorrow, which apply GIS&T to calculate quantitative indicators, often drawing on built-environment metrics as noted above, about alternative development proposals (Holway et al., 2012; Walker & Daniels, 2011). Suitability analysis is used to determine appropriate locations in the landscape through combining multiple variables in a raster analysis. For example, an analysis seeking to identify land suitable for development might consider soil permeability, slope, stream proximity, and floodplains (Berke & Kaiser, 2006, p. 179). Transportation analysis involves a wide range of GIS&T applications, such as calculating accessibility, proposing locations for public transit, and analyzing transportation networks. This topic is discussed in depth in the Application Domain article on GIS&T in Transportation. Urban modeling involves applying GIS&T, often in combination with specialized software, to simulate and predict different aspects of cities, such as travel patterns, land development, and environmental outcomes (Landis, 2011). Viewshed analysis utilizes elevation information to identify the portion of the land surface that is visible from one or more viewpoints. This analysis technique is commonly used to consider the visual impacts of new infrastructure or other landscape changes, such as wind turbines, power lines, and highways (Möller, 2006). Water-related analysis involves the assessment of water quality, groundwater resources, or watersheds, often involving specialized software such as ESRI’s Arc Hydro (Strassberg, Jones, & Maidment, 2011). The development of planning support systems (PSS) is one area where GIS&T are being adapted by urban planners to create tools tailored to planning questions. The term PSS has come to describe a wide variety of technologies used to aid planning through analysis, visualization, or sketching of alternative proposals (Brail, 2008; Geertman, Ferreira, Goodspeed, & Stillwell, 2015; Harris & Batty, 1993; Klosterman, 1997). While most PSS utilize GIS&T to some degree, they also typically extend beyond GIS due to the unique nature of planning questions. In a classic article defining PSS, Klosterman observed that “the heart of any PSS will undoubtedly be a GIS” (Klosterman, 1997). One popular PSS is CommunityViz, which operates as an ArcGIS Desktop extension, providing users with a range of additional analysis functionality, as well as the ability to create three-dimensional representations of planning proposals, or allow users to rapidly adjust analysis assumptions (Walker & Daniels, 2011). Another use of PSS has been sketch-planning tools to facilitate the rapid creation of land-use proposals. For example, the Envision Tomorrow ArcGIS extension allows users to create and summarize alternative land-use patterns (Holway et al., 2012). Figure 1. 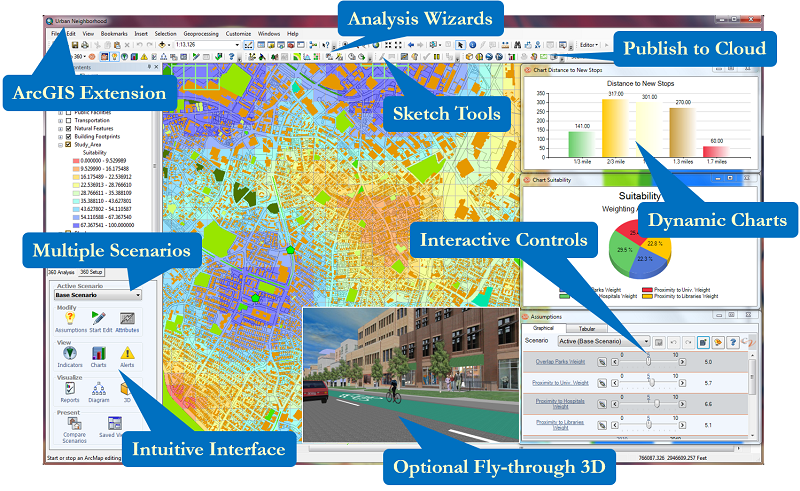 The CommunityViz Planning Support System illustrates some of the many ways GIS&T are used within urban and regional planning: to map the urban environment, conduct applied spatial analyses, create 3D simulations of planning proposals, and compared scenarios through quantitative indicators. Source: City Explained, Inc. Similarly, the concept of geodesign has emerged as a model for how to integrate advanced geospatial technologies with a collaborative design process (Steinitz, 2012). Geodesign projects “tightly couple the creation of design proposals with impact simulations informed by geographic contexts” (Flaxman, 2009). One recent example of a geodesign project utilized interactive touch-screens to engage stakeholders in a process of planning rural landscapes to improve their sustainability (Slotterback et al., 2016). Another project involved the use of GIS&T within a process which utilized evaluation maps and impact models to test the effects on alternative regional land-use patterns on regional water quality (Nyerges et al., 2016). Shifts in technology and global urbanization are resulting in exciting changes to how GIS&T are utilized in urban planning. This section briefly notes three: rapidly growing cities of the global south, the rise of smart cities, and the emergence of urban big data. The rapid growth of cities in the global south has accelerated the development of GIS&T applications tailored for their unique challenges. Although the analysis techniques described can in principle be conducted anywhere, data limitations and the unique structure of rapidly developing cities often requires adaptations. Where data are limited, planners may utilize globally available data sources such as raster layers derived from remote sensing, and new sources such as OpenStreetMap. Informal settlements may be missing from official datasets, and may demand novel analysis techniques (Giusti de Pérez & Pérez, 2008). These cities often have poorly-understood transportation systems which rely on semi-formal buses. In order to better understand one system, one project used cell phones to collect spatial data about bus routes, in order to create standardized data for mapping and route planning (Klopp, Williams, Waiganjo, Orwa, & White, 2015). The term smart city has recently attracted tremendous attention from city leaders, technology corporations, and scholars. Although diverse models abound, smart city initiatives typically involve new technology, organizational arrangements, and policies which result in the collection of new data, and investments in geospatially enabled management systems (Chourabi et al., 2012). One concrete example is the construction of the Rio de Janeiro Operations Center, used to manage megaevents and coordinate crisis responses (Singer, 2012). A related example is the creation of city dashboards to communicate urban data (Gray, O'Brien, & Hügel, 2016; Pettit, Lieske, & Jamal, 2017). Such initiatives are an exciting opportunity for planners to collaborate with others in the development and use of GIS&T data and technologies (Roche, 2014). However, the strong focus on urban management in smart cities means there remains an important role for urban planners to conduct mapping and spatial analyses directed towards long-term strategic questions (Goodspeed, 2015). Finally, urban planners are just beginning to explore potential applications of sources of spatial big data. Big data has been defined by four characteristics: growing volume, diverse variety of forms, high velocity, and concerns about veracity (Laney, 2001). Urban big data comes from a variety of sources: sensor systems, user-generated content, administrative systems, private sector data, arts and humanities data, and hybrid data (Thakuriah, Tilahun, & Zellner, 2015). Sensor systems collect data about the urban environment, such as the Array of Things project (arrayofthings.github.io) in Chicago, which plans to install sensors throughout the city to collect information about environmental conditions, like air quality, light, and sound. User-generated data is collected from social networking websites and other apps which citizens voluntarily use. Geotagged information posted to many social media websites, such as Twitter and the photo-sharing site Flickr, can be used to better understand local sentiment (Hollander et al., 2016) or explore social inequality (Shelton, Poorthuis, & Zook, 2015). In another example, researchers and practitioners are beginning to utilize data collected from users of the recreational biking app Strava to plan bicycle infrastructure. Administrative systems, such as property databases developed for taxation, are long-established big data sources. One new administrative source is data collected from smart card payment systems used on public transit systems, which provides analysts unprecedented detail about transportation system use (Pelletier, Trépanier, & Morency, 2011). Private sector data is just emerging as a practical data source. New companies, such as StreetLightData, process data anonymously collected from cars and smartphones to provide data about transportation patterns (StreetLightData, 2017). Private data can also be gleaned from private firm’s public websites and Application Programming Interfaces (APIs). Researchers collected rental housing listings from Craigslist to create a dataset with greater detail and resolution than those available from traditional sources such as the U.S. Census (Boeing & Waddell, 2016). A growing volume of arts and humanities data, such as historical spatial information, is being digitized and made available to analysts, such as the Residential Security maps scanned by the Mapping Inequality project to document the American urban inequality’s historical roots in U.S. government policies (Nelson, Winling, Marciano, & Connolly, 2017). Finally, mixed data sources like the EPA’s Smart Locations Database integrate dozens of data sources (Ramsey & Bell, 2014). Together, although urban big data sources hold the potential to reveal new insights, they also require planning professionals to develop new GIS&T analysis skills (French, Barchers, & Zhang, 2015). The future of GIS&T in urban planning is exciting but uncertain. On the one hand, GIS&T has become firmly established as an essential professional tool for representation, data management, and analysis, especially among planners in the sub-specialties described above. After decades of development, desktop GIS software is powerful, widely available, and utilized by a growing segment of the profession. On the other hand, developments in GIS&T may pose challenges for planners. The advent of web-based mapping software and tools introduces new technical barriers for customization even while opening up greater potential for collaboration. Funding for specialized applications such as geodesign or PSS tools remains limited, compared to the resources available for GIS&T software serving the private market. Finally, while big data holds great potential for planning, it remains uncertain about how these sources will be controlled, analyzed, and applied in effective ways that uphold ethical principles. Professionals and scholars interested in advancing GIS&T in urban planning will therefore be involved in a variety of activities to improve GIS&T methods, design and implement new tools, and shape the ways GIS&T are applied to address urban problems. Berke, P., & Kaiser, E. J. (2006). Urban land use planning (5th ed.). Urbana: University of Illinois Press. Boeing, G., & Waddell, P. (2016). New Insights into Rental Housing Markets across the United States Web Scraping and Analyzing Craigslist Rental Listings. Journal of Planning Education and Research. doi:https://doi.org/10.1177/0739456X16664789. Boone, C. G., Buckley, G. L., Grove, J. M., & Sister, C. (2009). Parks and People: An Environmental Justice Inquiry in Baltimore, Maryland. Annals of the Association of American Geographers, 99(4), 767-787. doi:10.1080/00045600903102949. Brail, R. K. (2008). Planning support systems for cities and regions. Cambridge, Mass. : Lincoln Institute of Land Policy. Brown, G., Schebella, M. F., & Weber, D. (2014). Using participatory GIS to measure physical activity and urban park benefits. Landscape and Urban Planning, 121(0), 34-44. doi:10.1016/j.landurbplan.2013.09.006. Chourabi, H., Nam, T., Walker, S., Gil-Garcia, J. R., Mellouli, S., Nahon, K., . . . Scholl, H. J. (2012). Understanding Smart Cities: An Integrative Framework. Paper presented at the 45th Hawaii International Conference on System Sciences, Maui, HI. Commercial Club of, C., Burnham, D. H., Bennett, E. H., & Moore, C. (1909). Plan of Chicago. Chicago: The Commercial Club. Drummond, W. J. (1995). Address Matching: GIS Technology for Mapping Human Activity Patterns. Journal of the American Planning Association, 61(2), 240-251. doi:10.1080/01944369508975636. Drummond, W. J., & French, S. P. (2008). The Future of GIS in Planning: Converging Technologies and Diverging Interests. Journal of the American Planning Association, 74(2), 161 - 174. Ewing, R., & Clemente, O. (2013). Measuring Urban Design Metrics for Livable Places. Springer-Nature. doi:10.5822/978-1-61091-209-9. Flaxman, M. (2009). Fundamentals of Geodesign. Paper presented at the Geodesign Summit, Redlands, California. French, S. P., Barchers, C., & Zhang, W. (2015). How Should Urban Planners Be Trained to Handle Big Data? Paper presented at the NSF Workshop on Big Data and Urban Informatics, Chicago, IL. Geertman, S., Ferreira, J., Goodspeed, R., & Stillwell, J. (2015). Planning Support Systems and Smart Cities. Switzerland: Springer. Giusti de Pérez, R. C., & Pérez, R. A. (2008). Analyzing urban poverty : GIS for the developing world (1st ed.). Redlands, Calif.: ESRI Press. Godschalk, D. R. (2006). Buildout Analysis: A Valuable Planning and Hazard Mitigation Tool. Zoning Practice, 23. Gray, S., O'Brien, O., & Hügel, S. (2016). Collecting and visualizing real-time urban data through city dashboards. Built Environment, 42(3), 498-509. Greene, R. P., & Pick, J. B. (2012). Exploring the urban community : a GIS approach (2nd ed.). Upper Saddle River, NJ: Pearson Prentice Hall. Grengs, J. (2007). Reevaluating Poverty Concentration With Spatial Analysis: Detroit in the 1990s. Urban Geography, 28(4), 340-360. Grengs, J. (2015). Nonwork Accessibility as a Social Equity Indicator. International Journal of Sustainable Transportation, 9(1), 1-14. doi:10.1080/15568318.2012.719582. Harris, B., & Batty, M. (1993). Locational models, geographic information and planning support systems. Journal of Planning Education and Research, 12(3), 184. Hollander, J. B., Graves, E., Renkski, H., Foster-Karim, C., Wiley, A., & Das, D. (2016). Urban Social Listening: Potential and Pitfalls for Using Microblogging Data in Studying Cities. London: Springer. Holway, J., Gabbe, C. J., Hebbert, F., Lally, J., Matthews, R., & Quay, R. (2012). Opening Access to Scenario Planning Tools. Retrieved from Cambridge, Mass. Innes, J. E., & Simpson, D. M. (1993). Implementing GIS for Planning Lessons from the History of Technological Innovation. Journal of the American Planning Association, 59(2), 230 - 236. Kent, R. B., & Klosterman, R. E. (2000). GIS and Mapping. Journal of the American Planning Association, 66(2), 189-198. Klopp, J., Williams, S., Waiganjo, P., Orwa, D., & White, A. (2015). Leveraging Cellphones for Wayfinding and Journey Planning in Semi-formal Bus Systems: Lessons from Digital Matatus in Nairobi. In S. Geertman, J. J. Ferreira, R. Goodspeed, & J. Stillwell (Eds. ), Planning Support Systems and Smart Cities (pp. 227-241). Cham: Springer International Publishing. Klosterman, R. E. (1997). Planning Support Systems: A New Perspective on Computer-Aided Planning. Journal of Planning Education and Research, 17(1), 45-54. Landis, J. D. (2011). Urban Growth Models: State of the Art and Prospects. In E. L. Birch & S. M. Wachter (Eds. ), Global urbanization (pp. 126-150). Philadelphia: University of Pennsylvania Press. Laney, D. (2001). 3D data management: Controlling data volume, velocity and variety. META Group Research Note, 6, 70. Maantay, J., & Ziegler, J. (2006). GIS for the urban environment. Redlands, Calif.: ESRI Press. McHarg, I. L. ( 1992). Design with nature. New York: J. Wiley. Möller, B. (2006). Changing wind-power landscapes: regional assessment of visual impact on land use and population in Northern Jutland, Denmark. Applied Energy, 83(5), 477-494. doi:10.1016/j.apenergy.2005.04.004. Nedovic-Budic, Z., Pinto, J. K., & Warnecke, L. (2004). GIS database development and exchange: interaction mechanisms and motivations. URISA Journal, 16(1). Nyerges, T., Ballal, H., Steinitz, C., Canfield, T., Roderick, M., Ritzman, J., & Thanatemaneerat, W. (2016). Geodesign dynamics for sustainable urban watershed development. Sustainable Cities and Society, 25, 13-24. Olshansky, R. B., & Wu, Y. (2001). Earthquake Risk Analysis for Los Angeles County under Present and Planned Land Uses. Environment and Planning B: Planning and Design, 28(3), 419-432. doi:10.1068/b2639. Pelletier, M.-P., Trépanier, M., & Morency, C. (2011). Smart card data use in public transit: A literature review. Transportation Research Part C: Emerging Technologies, 19(4), 557-568. doi:10.1016/j.trc.2010.12.003. Pettit, C., Lieske, S. N., & Jamal, M. (2017). CityDash: Visualising a Changing City Using Open Data. In S. Geertman, A. Allan, C. Pettit, & J. Stillwell (Eds. ), Planning Support Science for Smarter Urban Futures (pp. 337-353). Cham: Springer International Publishing. Ramsey, K., & Bell, A. (2014). The Smart Location Database: A Nationwide Data Resource Characterizing the Built Environment and Destination Accessibility at the Neighborhood Scale. Cityscape, 16(2), 145. Roche, S. (2014). Geographic Information Science I: Why does a smart city need to be spatially enabled? Progress in Human Geography, 38(5), 703-711. doi:10.1177/0309132513517365. Schlickman, E., & Domlesky, A. (2016). Using Your Illusion: Take a walk through virtual reality and other immersive environment tools for planning. Planning, May 2017. Schlossberg, M. (2003). GIS, the US census and neighbourhood scale analysis. Planning, Practice & Research, 18(2-3), 213. Shelton, T., Poorthuis, A., & Zook, M. (2015). Social media and the city: Rethinking urban socio-spatial inequality using user-generated geographic information. Landscape and Urban Planning, 142, 198-211. doi:10.1016/j.landurbplan.2015.02.020. Singer, N. (2012). Mission Control, For Cities. The New York Times. Slotterback, C. S., Runck, B., Pitt, D. G., Kne, L., Jordan, N. R., Mulla, D. J., . . . Reichenbach, M. (2016). Collaborative Geodesign to advance multifunctional landscapes. Landscape and Urban Planning, 156, 71-80. doi:10.1016/j.landurbplan.2016.05.011. Steinitz, C. (2012). A framework for geodesign : changing geography by design (1st ed.). Redlands, Calf: Esri. Strassberg, G., Jones, N. L., & Maidment, D. R. (2011). Arc hydro groundwater : GIS for hydrogeology. Redlands, Calif.: ESRI Press. Talen, E. (1998). Visualizing fairness: Equity maps for planners. Journal of the American Planning Association, 64(1), 22-38. Talen, E. (2000). Bottom-up GIS. Journal of the American Planning Association, 66(3), 279-294. Thakuriah, P., Tilahun, N., & Zellner, M. (2015). Big Data and Urban Informatics: Innovations and Challenges to Urban Planning and Knowledge Discovery. Paper presented at the NSF Workshop on Big Data and Urban Informatics, Chicago, IL. Walker, D., & Daniels, T. L. (2011). The planners guide to CommunityViz : the essential tool for a new generation of planning. Chicago: Planners Press, American Planning Association. Williamson, C. (2008). Planners and the census : Census 2010, ACS, Factfinder, and understanding growth. Chicago, IL: American Planning Association. Describe traditional and big data sources of spatial information about cities, and describe their strengths and weaknesses. Understand the strengths and weaknesses of indices for describing or explaining the urban environment. Apply cartographic principles to create maps which effectively convey information to diverse stakeholders. Create a raster analysis method to determine suitable locations for a particular planned facility. Create a collaborative process which incorporates GIS&T for an urban plan by applying tools and methods of planning support systems or Geodesign. Which data sets would be appropriate for creating and presenting a series of maps showing neighborhood demographic profiles? What factors should be included in conducting a suitability analysis to determine appropriate locations of a social service agency that serves low-income residents? What are the key assumptions that would be required in constructing an index of park needs in evaluating the equity of the distribution of park space in a city, and how would they influence the reliability of the analysis? Who would be likely stakeholders in using a planning support system to design alternative land-use scenarios and compute performance indicators to compare their sustainability performance? What steps can planners take to accommodate the various capacities of the stakeholder participants? In what ways does GIS&T contribute to effective urban and regional planning, and what are some key limitations in the technology that planners must be aware of?